I will be teaching a Stack n Whack Quilt class at "The Thread Bear" in North Vancouver on October 6th. This class is full. If you need more information on other classes I will be teaching Contact Me and I will forward you my schedule for upcoming classes. In my six hour class you will be well on your way to finishing your Stack n Whack quilt. From Bethany Reynolds book "The Magic of Stack 'n Whack", it's fascinating to cut up a dynamic printed fabric and see how the blocks come out. You will get several blocks made, enough to put up on your design wall to inspire you and your classmates. Incredibly, you get one block done and can't wait to see how the next one turns out. 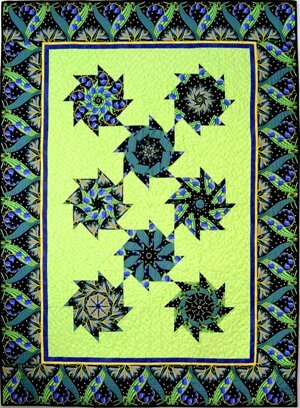 A closeup of the block and the border of this vibrant quilt. For example, you can use a vibrant floral print or an african animal print, kid's fabric or a nautical theme print. They all come out amazing. If your group wish to take Stack n whack quilt classes during a retreat Contact Me for more information or reservations. Finished with "Stack n Whack Quilt?" Return to "Classes I Teach"